The Jr. Kindergarten children (young 4’s through 5) take full advantage of the variety of material available to them. The classroom is divided into activity centers: art area, writing area, math area, book corner, dramatic play, manipulatives and circle time space. Materials are ever-changing in each activity center to generate continuing interest. The theme for the dramatic play area changes frequently from a variety of themes such as a newspaper office, day care center, pizza place, flower cart, grocery store, shoe store, housekeeping, fast food restaurant, and such. At this age, the children will be exposed to pre-reading, math, science and writing skills. They will use big book series of reading materials (which incorporates a whole language approach), involving story prediction, comprehension, rhyming patterns and beginning phonics. Our math program includes the use of manipulatives, Such as rods, counters, scales and patterning blocks. Circle time is different each day, yet we always do calendar, seasons, show and tell, and stories. Children are continually encouraged to write or dictate stories. Our science program is a combination of planned topics, hands-on activities, and cooking projects. The children’s natural curiosity and interests dictate part of the curriculum. Throughout the year we will also be focusing on ways to “save our Earth.” Organized games take place not only to develop skills like classification and letter recognition, but also such social skills as taking turns, sharing, and positive competition. Music and Story Reading – Periods provide an environment rich in language. Songs and stories are chosen which reinforce the weekly theme. Outdoor Play – offered daily, allowing children to run about, swing, climb and ride tricycles. Dance – Classes are offered each week. Children participate in creative movement. 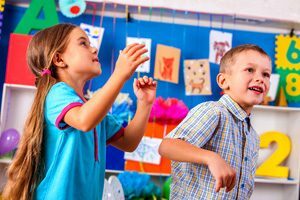 Special Activities – include a weekly session with our music specialist, in which children are encouraged to sing, dance and play instruments, as well as computer time in our computer room and optional swim program. Time – Each child is assigned a two inch mat to rest on within their classroom. Parents are asked to bring in a crib size sheet and a light blanket to keep at school.